Authors NOTE: This article is now "out of date" which is nuts. This technology is evolving so fast! I will be coming out with a new article soon, but this one still gets you 80% of the way there. NOTE: this article assumes you know what a ductless heat pump is, if you need some pre-education, click here. You can also visit my YouTube Channel for walkthrus on installed systems! The reason why I am writing this is pretty much the same as all my other posts; too often contractors offer you a ductless system without telling you what other options are available. So, in light of this, I am going to help you understand the 8 ductless residential systems that I have listed above. Settle in, because this is going to take a few minutes! Each of the eight has it's own special place in this world, so let's break them down so you can figure out what will work best in your application. This system is entry level ductless. You still get all the efficiency and "ductless" benefits, but usually warranty and features (like programming, etc.) are limited. If you hate your TV remote and technology in general, then this is the ductless for you! ON/OFF - HEAT/COOL. That's it. IF you want ductless AND you want the highest level of control, satisfaction and warranty, then a feature rich system suites you well. Things like 3D Airflow, programming, wi-fi, motion sensing, etc., etc. come built in! There are 3 types of ductless buyers; those who want just efficiency (Basic), those who want efficiency and comfort (Feature Rich) and those who are disgusted by the idea of a ductless head on their wall....Specialty!! If you are in this category you want ductless, but dread it at the same time. The specialty system, like the Fujitsu RLS2, might be for you. Still a feature rich system, but in slick packaging! The one drawback is that the sizing is limited so I would say you are going to get up to 1200 sq ft depending on how well the house was built. Did I mention that these are also the most efficient ductless on the market? Clocking in at 12 HSPF+, they are very much an option to consider. Remember, a multi-zone system is just one outdoor unit and multiple indoor units. Most 2-4 Zone Basic buyers are just folks who fall into the "basic" category but have a house or specific need that warrants a 2nd, 3rd or 4th head; say, the Master Bedroom needs its own cooling or the basement/upstairs needs a head for heating/cooling. Maybe the 4th head goes in the Bonus Room? Replace "basic" with "feature rich" in the paragraph above. Sorry...I'm lazy. This is where things start to get a little different so pay close attention. When you go to my pictures, etc. and look at ductless; do you see how each head has a line that runs from it all the way back to the heat pump? This is how the standard multi zone systems work, if you have 4 heads you have 4 lines. Now, with a Flex system 2 of those run into 1 and the other 2 run into 1 (this is called a branch), then you have only 2 lines that have to run all the way back to the Heat Pump (HP) outside. This is one difference about the Flex. The other is that the HP is a larger 4 Ton and will allow you to, say, have just 2 large 24k heads on it or all the way up to 6 smaller heads. Another difference is that while a standard 2-4 Zone Ductless has individual control points for each head (remotes/thermostats), the Flex can be operated from a SINGLE control. This allows for better management of a full home system. Fujitsu's HFI System falls somewhere in between Basic and Feature Rich, but when Daikin releases the RMXS Super Multi, I have a feeling it is going to be mind-blowing, word is that it will hit 11.3 HSPF on up to 8 heads. I want it NOW!.... tantrum. :) NOTE (11/18/14): We have been installing the RMXS for some time now, and it is AWESOME!! Further up and further in! This is getting a bit obscure, but it IS an option. Okay, think of the flex, but those 2 lines that came back to the Heat Pump outside go into 1 and just 1 line goes out to the HP. This is possible because the metering of refrigerant is no longer done at the HP it is done at the indoor. Again, we do install these, but here is an application. Million Dollar Home. Everything hidden, zoned, perfect and integrated into building management software for commercial buildings.... but its a house. You see where I am going? That guy is obviously European! This system has been booming in Europe for a while and is now starting to destroy Geothermal here in the northwest. Hands down, this is the system that is the one to beat in custom construction right now. Radiant Heat with Inverter Heat Pump, Cooling to Fan Coil or Head, Domestic Hot Water with Solar Optional. Man oh Man. SUMMARY: IF YOU ARE BUILDING A HOME WITH RADIANT HEATING, YOU HAVE TO ASK ABOUT THIS SYSTEM! Watch video (it starts over at about 6:20...crazy Euros). Sorry, this one just does too much stuff to describe in text. Good informative post.I bookmarked your blog for next time visit. 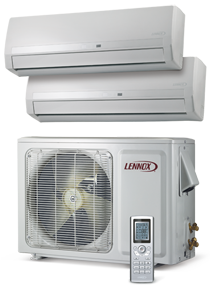 Thanks for sharing information on various types of ductless heat pump.. I was really not aware of ductless types.. Waiting for your next post..
Great blog, when i made new home i am install this ductless system and suggesting also my freind. I saw the video. This is interesting. I prefer electric heating systems. Heating is the main issue in cold places. I live in Ireland. This is not possible there to spend any night without any heating arrangement in winters. Recently I have installed a new Domestic heating system by Farho. This is doing a good job.